Today's idea is a Faux Pocket Card. 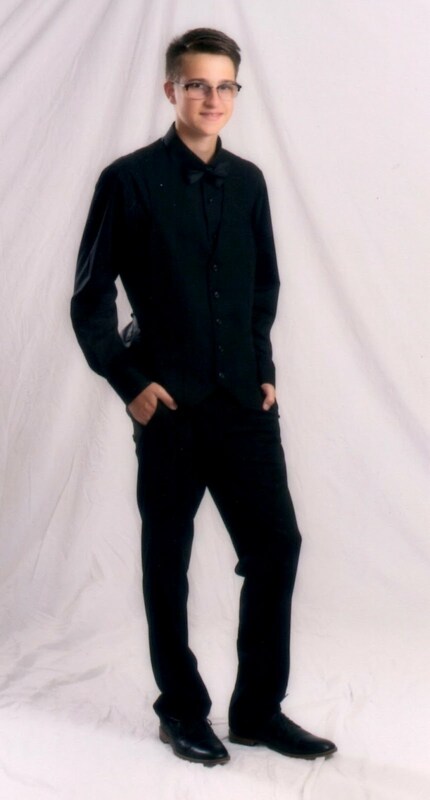 to put the faux pocket together. I used this cute stamp by Northwoods Rubber Stamps. a Cuttlebug diagonal striped embossing folder. Scalloped border is EK Success. Stamp by Northwoods Rubber Stamps (m8777). Colored with Copic Markers. I cut a piece of acetate for the jar part to resemble glass. 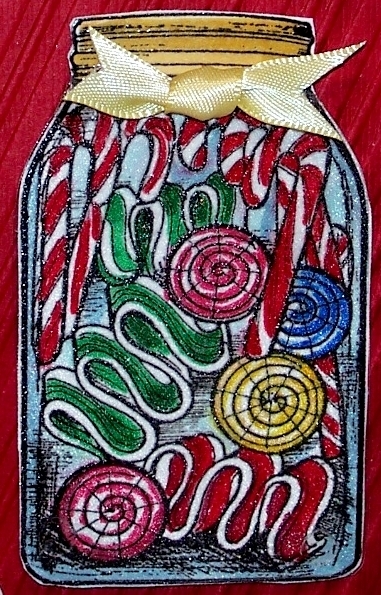 The Candy Canes are embellishments by Petaloo, called Holiday Dazzlers. I made the tag from white card stock and traced it from a purchased tag. Covered the top portion of the tag with candy striped paper. 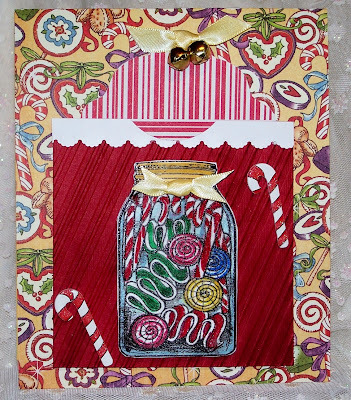 Sentiment is by Stampendous, called Merriest Wish(CRM276). 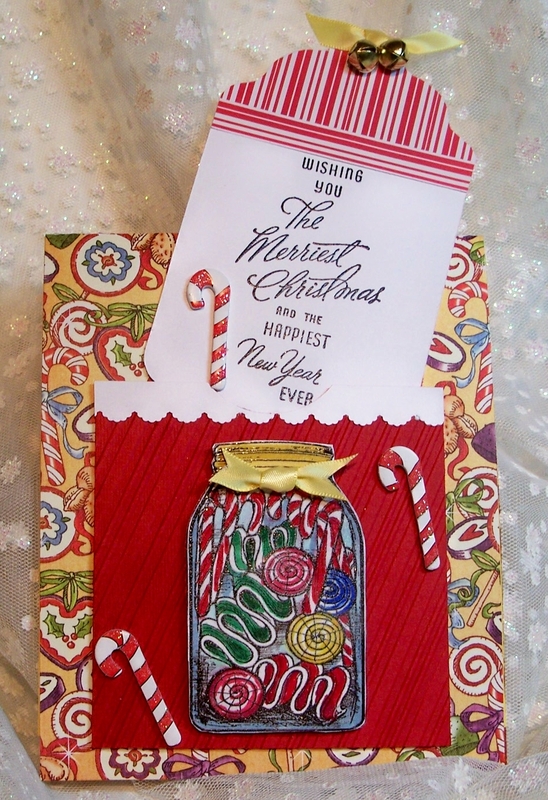 Yellow satin ribbon, jingle bells and another candy cane embellishment finishes it off. Hope you have a chance to try the Faux Pocket card. You could even put a gift card on the tag for holiday gift giving. great and fantastic card sue. Fabulous design,very clever! Love all the vibrant colours! We were just reminiscing about ribbon candy. My Mom used to fill candy dishes with that and small hard candies every Christmas. 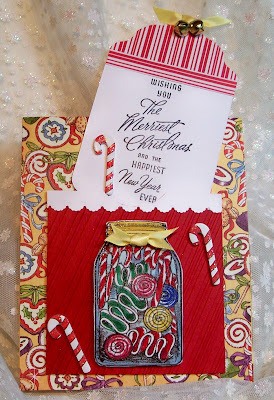 Love this sentimental and artistic card.